The trend of cord-free mobility continues to influence the consumer electronics marketplace to a considerable extent. Gadgets such as stereo headphones are becoming essential products in consumer lifestyles, and their daily and frequent usage has propelled the intervention of wireless technologies. New wireless stereo headphones are becoming attractive among tech-savvy consumers. Headphone manufacturers around the globe are capitalizing on the growing popularity of wireless operability. Companies namely, Sivantos Pte. Ltd., Sonova Holding AG, Cochlear, MED-EL, Beltone, Miracle Hearing Aid Clinic, Persona, Shenzhen Sunsky Technology, Siemens Healthcare, Starkey Hearing Aids, Union Hearing Aid Centre, Eartone, GN ReSound, Medtechnica Orthophone, William Demant Holding A/S, GN Store Nord A/S and Widex A/S are categorically extending their presence in the global wireless stereo headphone market. These manufacturers are being observed as the key stakeholders in the global wireless stereo headphone market, and are expected to cater to the rising global demand in the near future. 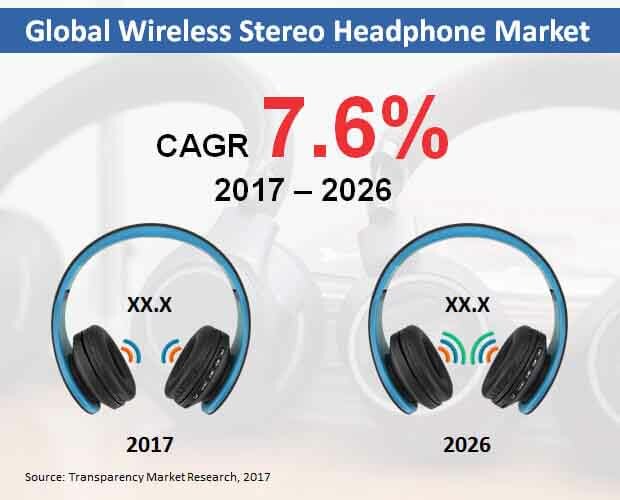 Transparency Market Research’s latest forecast study projects that these companies will spearhead the global production of wireless stereo headphones during the forecast period, 2017-2026. The report estimates that by the end of 2026, over 237 thousand units of wireless stereo headphones are expected to be sold across the globe. The report further projects that the global wireless stereo headphone market will expand robustly at an estimated volume CAGR of 7.6% during the forecast period. In 2018 and beyond, a majority of wireless stereo headphone manufacturers will be focusing on catering to the droid consumer base. High penetration of Android user operating systems over iOS will continue to influence the global wireless stereo headphone manufacturing landscape. While Android-based wireless stereo headphone cost cheaper than their iOS counterparts, the profit margins are lucrative as there is a certain scope for more volumes of headphones being sold. By the end of 2026, more than 190 thousand units of wireless stereo headphones are expected to be sold across the globe. The report projects that multi-branded stores are the largest distributor channel in the global wireless stereo headphone market. In 2017, nearly 45 thousand units of wireless stereo headphones were distributed globally through multi-brand stores. In the near future, online distribution of wireless stereo headphones is also expected to pick up pace and register the highest volume CAGR of 8.6% over the forecast period. The report findings further indicate that North America will remain the most lucrative marketplace for wireless stereo headphone through 2026. By the end of the forecast period, more than 97 thousand units of wireless stereo headphones are expected to be sold in the US and Canada. The report also estimates that multi-brand stores in the US will be among the key distributors in North America’s wireless stereo headphone market. The report also projects that several market players will be eyeing at expanding their manufacturing bases in the Asia-Pacific excluding Japan (APEJ) region. High presence of skilled labor and access to affordable raw materials will continue to drive the expansion of wireless stereo headphone market in the APEJ region. By the end of 2026, more than 30 thousand units of wireless stereo headphones are expected to be sold across the APEJ region.